Matcha Republic looks stylish with its white and gold look. When you say matcha in Kyoto, many people think of traditional Japanese shops, but this shop is more of a western, modern take on it. The shop and its atmosphere are very exciting, but the drinks are even more exciting. 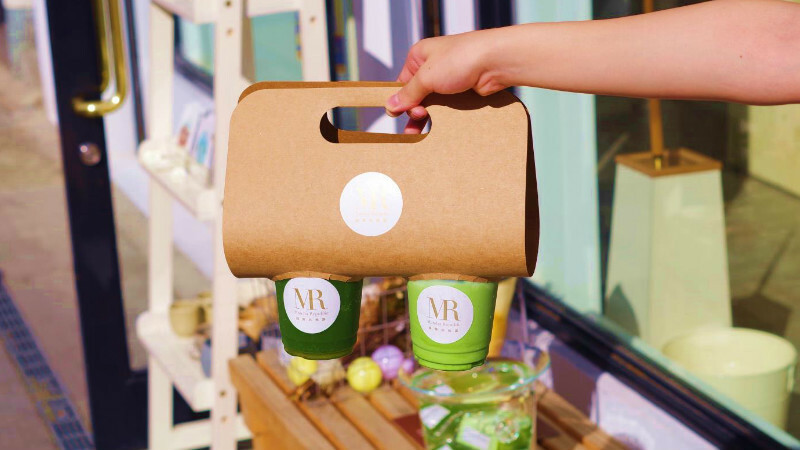 This shop is actually a place for a matcha shop specializing in Uji matcha to try their new products, so you can enjoy matcha drinks made from freshly ground matcha. The drinks here are only made of matcha. And they’re unique ones you can’t find at other shops! This shop is great for those who want to try a new way of enjoying matcha. This matcha latte is served in a rarely seen cute ink bottle-shaped container I have not seen elsewhere. It’s made of glass and looks just like an ink bottle, and the shape of it is very cute. It’s so cute that there are always people taking pictures of it. Not only does it look cute, but because it’s made using freshly ground Uji matcha the taste is also great. It has enough of that “matcha taste.” They also have matcha green tea and matcha zenzai, so altogether they have three different types of matcha ink-drinks. You can also buy this drink to go as a souvenir. Rock salt cheese matcha latte / ￥680 *Picture above is M-size. This rock salt matcha latte contains Uji matcha with rock salt and cream cheese. This is a special drink you can only have here, so I hope you will try it. On top of the Uji matcha drink you have a thick cream cheese “crema.” The cream cheese crema also contains whipped cream so it’s thick with a smooth texture. When drinking this, it’s almost as if you were eating a sweet made of matcha and cream cheese. The slightly salty rock salt brings a nice accent to the taste. On top of the crema you have the phoenix of the Phoenix Hall of Byodo-in Temple, a famous place in Uji, so this is a special drink to have when visiting Uji. Matcha soda / ￥480 *Picture above is M-size. This is a matcha soda, a drink you don’t often see in other shops. The combination of matcha and soda is rare, and I couldn’t imagine the taste before drinking. But as I drunk it, I noticed that the taste was even better than I had thought. The refreshing taste of matcha and the bubbly soda go together well, without feeling like a mismatch. The drink contains small pieces of dried lemon so it’s easy to drink and the aftertaste is refreshing. The drink is not too bubbly so anyone can drink it. This drink is not too sweet but has a clear taste, so I recommend it to those who don’t like sweet drinks. They have something else up their sleeves besides the drinks. You can enjoy the ultimate premium soft serve. This matcha Cremia is made by topping the premium soft serve Cremia with high-grade matcha from Uji. The rich taste of sweet milk in Cremia and the slightly bitter matcha go together well. The taste of cream is rich but the aftertaste does not linger and is not too strong. The cone is actually made of buttery French cat’s tongue cookie dough, so this soft serve truly is more refined than most. Their menu has English on it. Don’t sit right away, but first, pay for what you’re ordering. After paying, the staff will bring you what you ordered. You can also buy drinks to go. You get a paper container to hold your drinks, so they’re easy to carry. This container is not something you see often and it looks very fashionable. It’s not only fashionable but also practical, as you can see which drink is which as the bottom side of the drinks are not covered. It might be a good idea to buy some matcha drinks to go when sightseeing in Uji if the weather is nice. This is a shop that changed my idea of matcha, in a good way. The shop feels Japanese, but it’s still extremely modern and chic. The interior of the shop uses a beautiful combination of white and gold, and I wanted to take pictures of it. 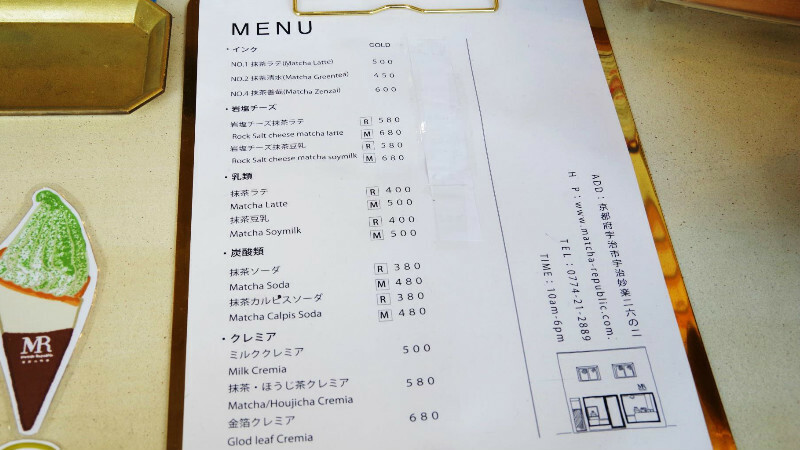 I love matcha, and I have eaten many kinds of sweets, but still the drinks here were a first for me! All of them were very unique drinks you can’t have elsewhere. The drinks are all cute and the taste of matcha was the best! I love matcha! If you think this way, or if you “want to take instaliscious pictures, then I recommend you this shop! A 5-minute walk from JR Uji Station. 10:00 a.m.-6:00 p.m. *Soft serve is sometimes sold even after 6 p.m. Accepted. LINE Pay and Alipay also accepted.